Our Wild Birds: Wake Up Call!! 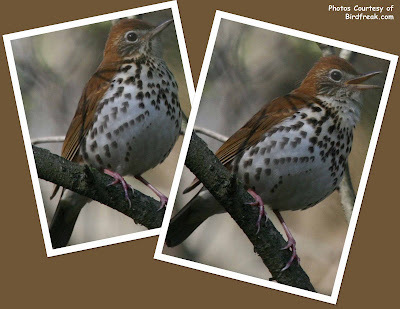 I was pleased to hear the song of the Wood Thrush this morning upon waking. This species has a tough row to hoe, being one of our neo tropical migrants. Their population is on a sharp decline due to loss of habitat both here and in their wintering grounds. Another quick note.... Seems that the Barred Owls have chosen to nest in the "in very poor shape" owl box that they have nested in in the past. :-/ As stated earlier, I am very concerned about the condition of the box.